Someone described Xperia Z as “the best phone you will probably never buy”! Well, this is your chance to get it for free! Join Club Trendy Today! 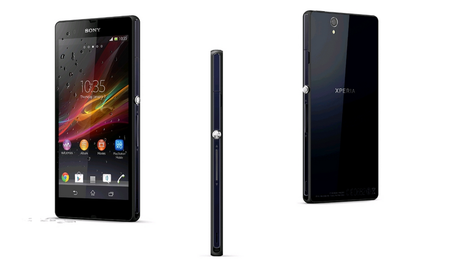 With Xperia Z you can experience the best of Sony in one smartphone. It has a sharp 5-inch Full HD screen and thanks to innovative BRAVIA Engine 2 technology, the colours on your Xperia Z screen will be brought to life. This also means sharper photos captured with a 13-mega-pixel camera. With a 1.5 GHz quad-core Snapdragon processor and an Adreno 320 GPU, LTE connectivity, this Android smartphone is definitely a high-end smartphone worthy. So what are you waiting for?! 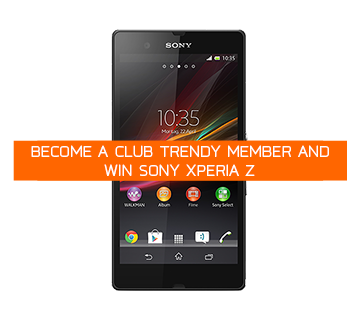 Become a member of Club Trendy and this top range smartphone from Sony could be yours. To participate in this monthly competition you need to follow few simple steps. By purchasing any of products at our online store you automatically enter the contest. Simply register with your email address. Apart from the chance of winning this amazing prize, as a Club Trendy member you also get a 7% discount on all online orders, information about special offers and new products. The new Club Trendy contest ends on 1.12.2013 and the winner draw will be done on 1.12.2013. Do not miss this chance to win Sony Xperia Z!